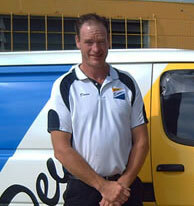 Devin Pearce (Owner of Devin’s Windscreens) started Devin’s Windscreens, as a homebased busines in 2004. Wamuran. He commenced the business as a one-man Windscreen fitting and repair business, operating at all hours of the day and night as per his motto “Anywhere, Anytime”. The business underwent expansion onto Beerburrum Road, Caboolture where they occupied a commercial premises for several years. Devin’s Windscreens has since been scaled back to a smaller team with more of a focus on personalised, MOBILE service. They service all areas throughout the South East Qld including their local area; Wamuran, Kilcoy, Caboolture, Morayfield, Beerwah and Bribie Island. Over the past 20+ years, Devin has been able to grow Devin’s Windscreens into a profitable and prosperous business that is highly regarded within the Automotive Glass Industry. The familiar yellow and blue Mobile Service Vans are still servicing all over South East Queensland. Feel Free to Request a Quote, Ask a Question or Make a Booking! © Copyright 2016 Devins Windscreens.